Most fuel injected vehicles are fitted with a mass air flow (MAF) sensor to measure air velocity which the computer uses to determine the proper air/fuel mixture. However, the MAF sensor gets dirty with debris, oil, grease and air filter fibers, causing inaccurate measurements of air flow which results in a 'rich' running engine, loss of power and excess emissions. 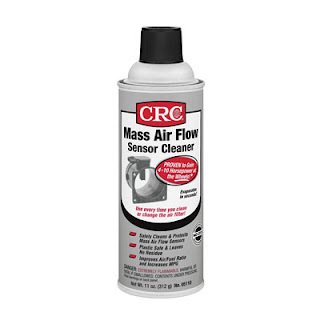 CRC MAF Sensor Cleaner will safely clean and protect your mass air flow sensor, works to gains 4-10 horsepower, correct rough idling, hesitation, pinging, improving air/fuel ratio and increasing kilometers per liter. Plastic safe - dries in seconds! leaves no residue. Use every time you clean or change the air filter. The use of aggressive products like brake and carburetor cleaners on MAF sensors can cause serious damage to sensitive parts.